Federation is excited to be a part of the Sydney Gay and Lesbian Mardi Gras, to celebrate the diversity of our members as well as the students and families that make up our public schools. This year will mark the ninth year of Federation’s formal involvement in the Mardi Gras program. The first Mardi Gras event involving Federation this year is Fair Day on Sunday, 17 February. This fun-filled occasion is held in Victoria Park, Broadway, and mixes families activities, dog shows, live performances and stalls from a range of business and community organisations to create a welcoming and celebratory atmosphere. Fair Day is one of the opening events of Mardi Gras festivities and Federation will host a stall where volunteers are always welcome to join in. To be part of the stall team contact lgbtiq@nswtf.org.au with a time that you are available on the day. Federation will also be part of the Mardi Gras parade on 2 March, which carries the overarching theme of “Fearless”. Federation’s float symbolises our support of inclusive and supportive environments for all students, parents, teachers and the broader community. The float highlights the vital role teachers and the union play in ensuring all students and teachers in public schools feel safe to be themselves, and our commitment to continue protecting and pioneering for inclusive education and rights for lesbian/gay/bisexual/transgender/intersex/queer (LGBTIQ) people in our schools. Opportunities to be involved in Federation’s float will be made available to members of the LGBTIQ Special Interest Group in the first instance, with all members being notified through Federation’s website if further space on the float is available. Workshops are being held to create costumes for our marchers, with the next on Saturday, 9 February, between 9am and 4pm at Federation House. Members can RSVP by contacting lgbtiq@nswtf.org.au. 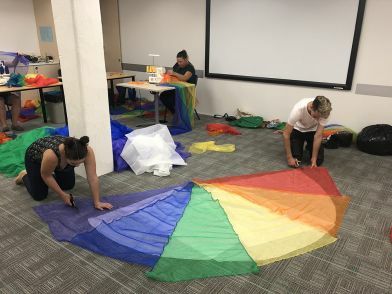 Members who are supportive of LGBTIQ matters and how they affect teachers and schools are encouraged to join Federation’s LGBTIQ Special Interest Group (SIG). The SIG welcomes new members, including LGBTIQ identifying members or allies. To join, please contact Federation on (02) 9217 2100 or email lgbtiq@nswtf.org.au. Teachers can also access information on LGBTIQ issues on Federation’s website under the “My Interests” tab. © New South Wales Teachers Federation. All Rights Reserved.